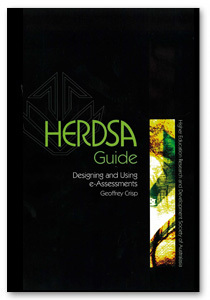 This HERDSA Guide highlights some of the key issues surrounding the use of e-assessment and provides examples and practical advice on how teachers might engage students in more interactive online tasks. It presents a realistic view of what is now possible through the use of computers and the Internet in higher education assessment. It specifically discusses the important relationship between learning, teaching and assessment, and presents a number of frameworks for aligning e-learning activities and e-assessment tasks. The Guide covers e-assessment possibilities ranging from simple computer marked multiple-choice questions, through to elaborate role-plays, interactive simulations and online scenarios. There is no suggestion in the Guide that e-assessment will replace all traditional assessment tasks; it highlights the necessity for teachers to be aware of the new opportunities for enhancing the quality of assessment tasks through the use of computers and the Internet. The Guide also emphasizes that if students are using the Internet or computers as part of the learning environment, they should also use these tools to complete their assessment tasks. Numerous examples of how teachers can prepare engaging questions that will test higher order capabilities in students are provided in the Guide. This second edition updates the e-assessment possibilities reflecting the advances that have been made since the first edition was released in 2009. Professor Geoff Crisp is the Dean Learning and Teaching at RMIT University. Geoff was an academic teacher and researcher in chemistry until 2002 and then moved into academic development and online education. The winner of a number of teaching awards, Geoff received an Australian Learning and Teaching Council Associate Fellowship in 2006 and National Teaching Fellowship in 2009 both of which focused on e-assessment. Geoff is a HERDSA Fellow and was President of HERDSA from 2009 to 2011.